MAITUM, Sarangani —Whenever the weather is fine here, the vast Celebes Sea usually offers a spectacular view of the sunset, a fitting moment to end the day in a glorious mood. It is usually during these times when a bunch of local fishermen often gather to share a round of tuba or coconut toddy to soothe away their tired nerves after a hard day’s work. Along the shorelines dotted by tall coconut trees swaying from the ocean breeze, they banter and laugh, or share stories on how their day went through, some pouring their woes, as the local wine intoxicates them while the night goes deeper. As part of Filipino culture, drinking sessions wouldn’t be complete without the pulutan or appetizer, and in the case of the fishermen, the exotic sea turtle, locally called “pawikan,” is often on the table. “The meat of the sea turtle tastes like beef. 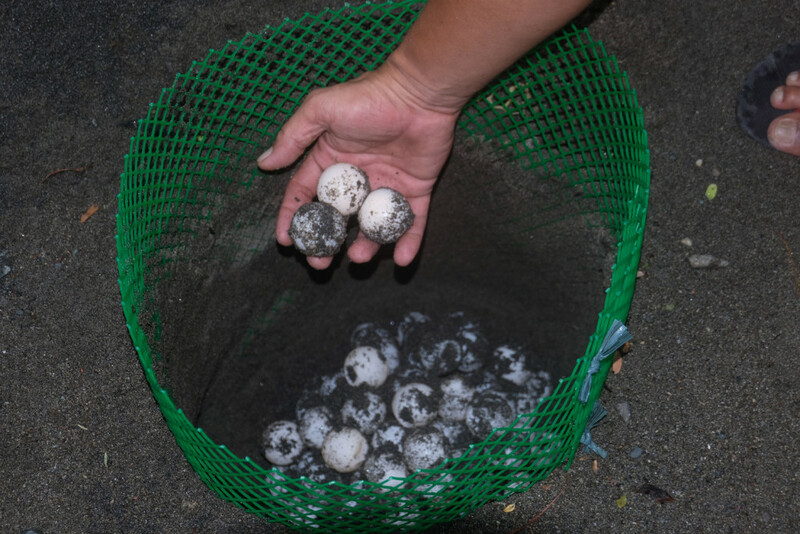 We also did not spare the turtle eggs,” fisherman Arnulfo Valderama said at the veranda of his small house built several meters away from the seashore. “But that was in the past, during the 1980s (to the 1990s),” he added quickly. Valderama and his wife, with their first child then, settled at the quaint coastal Barangay (village) Kiambing in 1985 from the upland farming village of Pangi, also of this town. Now 55 and with his three children all grown-up, he swore to high heavens, shaking his head vehemently, that the locals are “no longer a threat” to the sea turtles. In 2001, the Philippines approved Republic Act 9147 or the Wildlife Resources Conservation and Protection Act. The law imposes a jail term of six to 12 years and fines ranging from P100,000 to P1 million for violators of species listed as critical; four to six years imprisonment and a fine from P50,000 to P500,000 if inflicted against endangered species; and, two to four years imprisonment and a fine from P30,000 to P300,000 if inflicted against vulnerable species. Several meters from the Valderama residence, hundreds of sea turtle eggs are buried some two feet under the sand for hatching. Officially, this is known as the town’s “Pawikan Hatchery and Learning Center,” where a P2 million single story building is being constructed to boost the conservation of endangered sea turtles in this part of the country. Nannette Nacional, the town’s chief environment officer, said that sea turtles have been nesting their eggs in the locality’s coastal villages since the past several decades. “Even in my childhood, I could remember seeing sea turtles in our beaches. They are still around until now,” she added. The first hatchery in the town was established in Barangay Old Poblacion in the early 2000s, but Nacional said this was transferred to the present site in barangay Kiambing in 2015 due to the overpopulation in the old location. The Video-K machine and the cottages there were distracting the sea turtles from nesting and the eggs from hatching, so the nursery was moved to a donated land in Kiambing, the official said. Nacional stressed that villagers embraced the conservation of endangered sea turtles because of the sustained information and education campaign on the vital role of the reptiles in the marine ecology. Holding office in nearby Kiamba town, Jessica Guilao, chief of the Biodiversity Management Services for Makima of the Community Environment and Natural Resources Office, identified Olive Ridley, Hawksbill, Green Turtle and Loggerhead as the sea turtle species that have been nesting in the province. Makima stands for Maasim, Kiamba and Maitum, three adjoining municipalities in the western side of Sarangani province where sea turtles are known to nest. Olive Ridley is the most common species that can be found in the area, she said. Also known as Pacific Ridley, Olive Ridley (Lepidochelys olivacea) is categorized as vulnerable, meaning its population is decreasing, under the International Union for Conservation of Nature (IUCN) Red List of Threatened Species. Hawksbill (Eretmochelys imbricate) is classified as critically endangered, Green Turtle as endangered (Chelonia mydas) and Loggerhead (Caretta caretta) as vulnerable also in the IUCN Red List of Threatened Species. Guilao, who has worked in Makima area for at least two decades now, described sea turtles as the “janitors” of the ocean as they feed on sea grasses and sponges. “These sea turtles are likely among the factors why different kinds of fishes thrive in our ocean. They help maintain the health of sea grass beds and coral reefs (that are crucial for other marine elements to multiply),” she told this reporter who produced this article with the support of Internews’ Earth Journalism Network Asia-Pacific Project. Guilao stressed the need to conserve the sea turtles, noting that out of the hundred hatchlings that were released to the ocean, only a few will get to mature due to their exposure to the elements, including predators. “Out there in the wild, it’s a survival of the fittest,” she stressed. Guilao lauded the coastal communities straddling the three towns of Maitum, Kiamba and Maasim for helping prevent the extinction of the endangered sea turtles. “The awareness of the communities is high due to our continuing education campaign, which is a key component of our conservation efforts,” she said. In 2010, another hatchery was established in Barangay Lumasal in Maasim town, more than 30 kilometers away from the existing hatchery in Barangay Kiambing in Maitum town, to serve the growing awareness of the locals on the need to preserve the sea turtles. 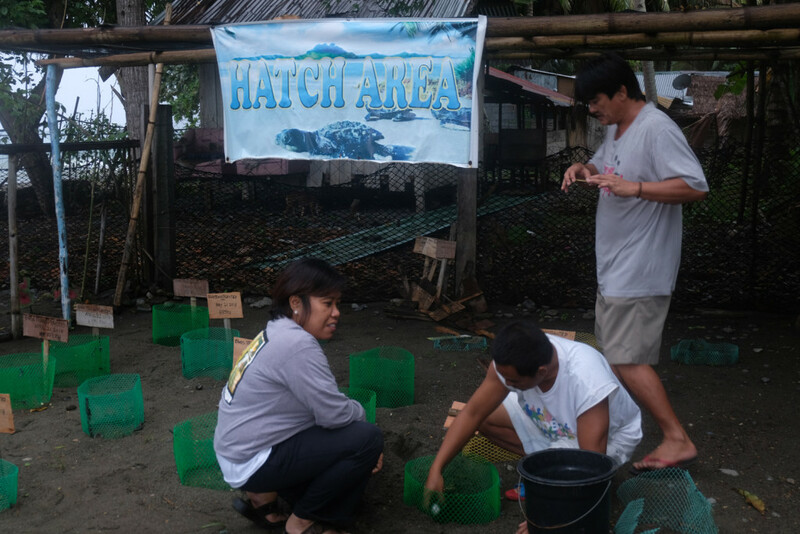 Edilbando Paras, whose family donated the property for the hatchery in Maasim town, said that residents from adjacent barangays would inform or turnover to the hatchery the sea turtle eggs that they discover. “Things have changed a lot. Decades ago, the locals slaughtered sea turtles and sold their meat to the Chinese community in General Santos City. For others, they exchanged the sea turtle eggs for canned goods,” said Paras, also the caretaker of the hatchery. Before year 2000, the sea turtle meat was traded for P200 to P300 per kilo, he said. He attributed the change in people’s attitude to their education campaign that emphasizes the jail terms or fines imposed by the law against violators. “Before, the villains to the sea turtles were our people. Now, our people are heroes in the eyes of the sea turtles for helping prevent their extinction,” Paras told MindaNews early in June, which the Philippines celebrates as Environment Month. The sea turtle conservation has become a tourism attraction for the towns of Maitum and Maasim. Both hatcheries are easily accessible from the national highway, with the one in Maitum having a fully concreted road. If the tourists are lucky, they could chance upon and take part in the releasing of newly hatched sea turtles to the ocean. It takes 45 to 60 days for the sea turtle eggs to hatch, and the annual nesting period is usually high from January to June, data showed. Hatching rate using the natural method, meaning the eggs are buried in the sand and not put in an incubator, depends on the weather — 90 percent when it’s sunny and 60 percent when rainy on the average, Paras said. Since 2015, the hatchery in Maasim town, which has eight known sea turtle nesting sites, has released at least 8,000 hatchlings to the ocean, according to him. There is no entrance fee so far to the two hatcheries whose visitors mainly include elementary, high school and college students as part their educational exposure. But tourist arrivals have benefited a few so far, including Rodrigo Danial, a member of the T’boli indigenous people’s group whose family operates a small sari-sari (mom-and-pop) store a few meters away from the hatchery in Maasim. “They would buy soft drinks, biscuits and candies, among others, from our store, increasing our sales even though not that much,” Danial said at their visibly impoverished neighborhood. Danial, who was designated by the local government unit as a hatchery caretaker, expressed optimism the turtle conservation efforts will boost local tourism so that many others can benefit from its commercial impact. “Besides helping prevent the extinction of sea turtles, the conservation efforts also turned us into disciplined individuals. Community members help clean the seashore because it’s embarrassing to the visitors when the surrounding is dirty,” the 44-year-old father of four said. 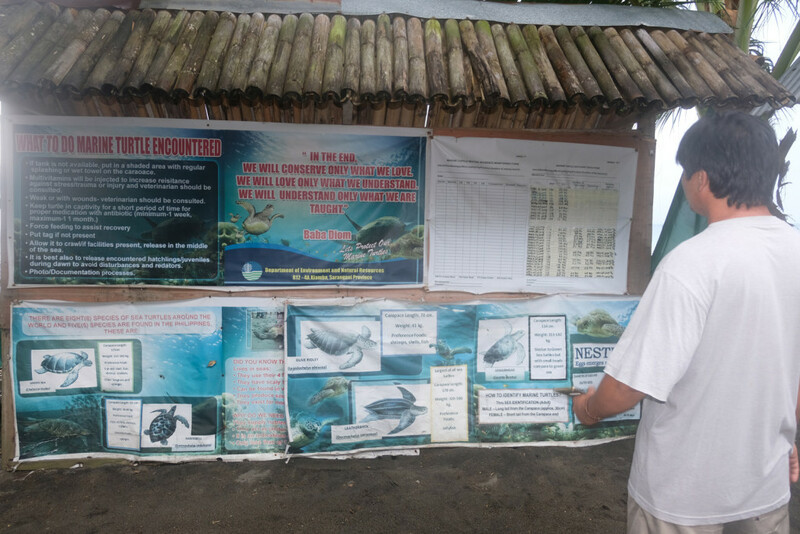 Ariel Ortiz, Dean of the College of Fisheries of the Mindanao State University in General Santos City, commended the efforts of the stakeholders in Maitum and Maasim towns to conserve the endangered sea turtles. “The presence of sea turtles indicates a healthy and balance marine environment. If they are not around, it means the environment is not well,” said Ortiz, a marine biologist. He stressed the sea turtle conservation effort in Sarangani province was a good way to protect or ensure the continuity of the transoceanic reptiles’ genetic line up. For Sherwin Cuaresma, the caretaker of the hatchery in Barangay Kiambing in Maitum town, it is but fitting to prevent the extinction of the sea turtles. 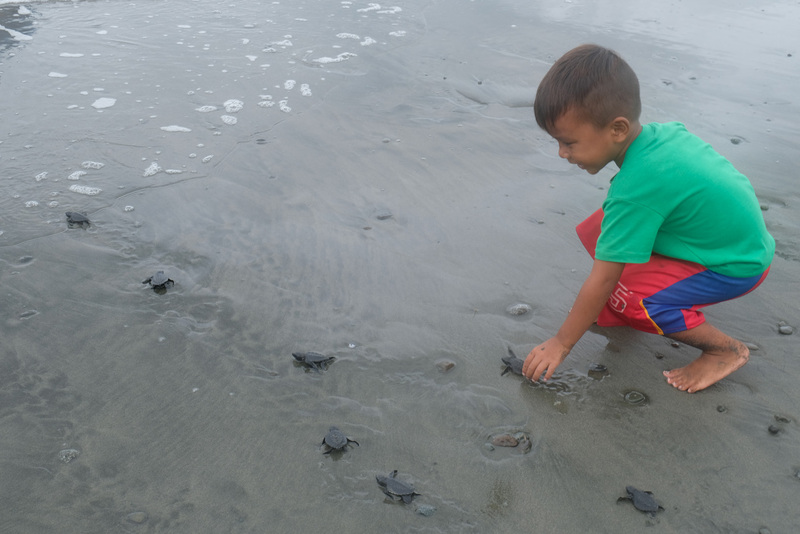 “We don’t want our future generation to see the sea turtles only in the books,” he said. The story is made possible by the support of the Internews’ Earth Journalism Network under the Asia Pacific Project funded by the Swedish International Development Cooperation Agency (SIDA).